1 Preheat oven to 180C. 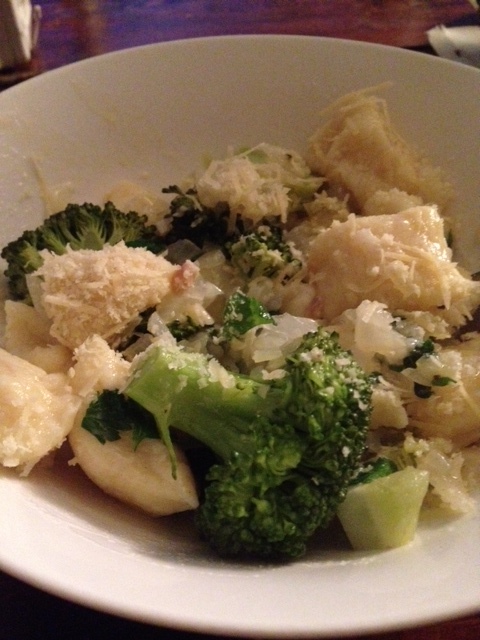 For ricotta gnocchi, cook potatoes in a large saucepan of boiling salted water until tender (15-20 minutes). Drain and cool slightly, then peel and pass through a potato ricer into a large bowl (alternatively, mash the potato). Pass ricotta through a course sieve into potato, then add remaining ingredients, season to taste and gently mix until just combined. Divide dough into four pieces and roll each on a lightly floured work surface to a 1.5cm-thick cylinder. Cut into 2.5cm lengths and cook, in batches, in a large saucepan of boiling salted boiling water until gnocchi float to the surface (1-2 minutes). Remove with a slotted spoon, refresh, and set aside on a lightly oiled tray. 2 Meanwhile, for pangrattato, combine ingredients in a large bowl, spread over an oven tray and bake, stirring occasionally, until golden (6-8 minutes). 3 Heat oil in a large frying pan over low heat, add onion, garlic and chilli and stir occasionally until caramelised (5-6 minutes). Add broccoli, increase heat to medium-high and stir occasionally until broccoli is tender (4-5 minutes). Add butter and stir until melted. Add gnocchi, toss until golden and combined (2-3 minutes), season to taste. Divide among plates, scatter over pangrattato and grated parmesan and serve immediately.